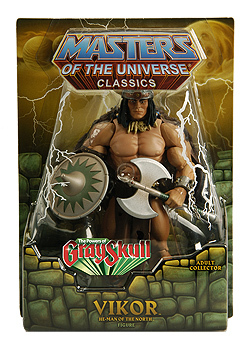 The latest Masters of the Universe release on Matty Collector - Vikor - sold out in mere minutes today. There was some speculation that Vikor was produced in lower quantities than recent MOTU releases, but as it turns out, the full compliment of Vikor was not available at the time of sale. Darn those blustery Northern winds! They’ve waylaid our second Vikor shipment for the moment, but we expect it to land at our warehouse soon. As soon as we confirm its arrival, we’ll have more Vikor figures for sale. That's some good news for fans who missed out on the He-man of the North. The bad news is that you now have to wait until an unannounced later date to battle the Matty Collector ordering gauntlet once more. Were you one of the lucky few who captured Vikor today? Are you a card carrying MOTU club member, laughing at the misfortune of others as you admire your Vikor figure? Leave a comment below and let us know.